We ran out of white flour nearly a week ago and I’ve hardly noticed. I’m still on my buckwheat craze and am having way too much fun making pretty much everything, even waffles, out of it. I say “having way too much fun” because I’m not sure the level of indulgence in this recipe is permitted in a grown-up household. We’re parents now. Are we allowed this kind of mischievous pleasure? 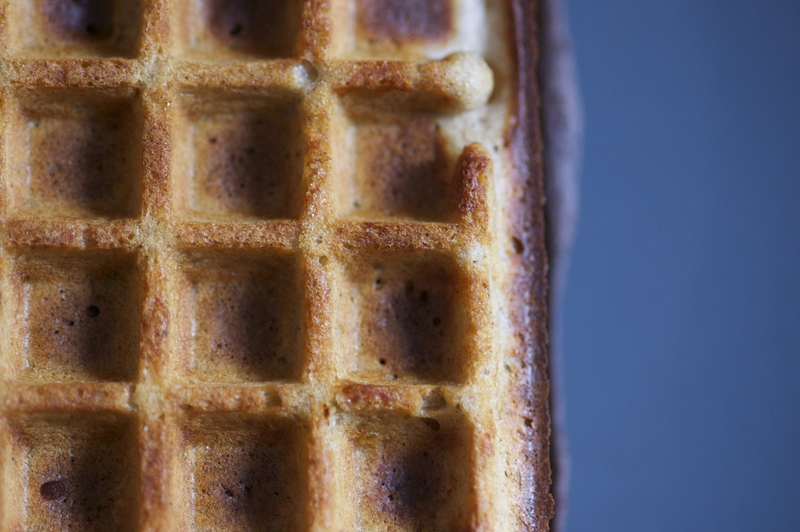 Seriously, these savory waffles (filled with creamy French blue cheese) are more decadent than those covered in strawberries and whipped cream or chocolate spread – I’m not kidding. There’s more than just the taste that makes savory waffles so much fun. First of all, having waffles for dinner breaks the rules. Like most Americans, I grew up eating them for breakfast. Sébastien would have them at his grandmother’s house for dessert. When I say, “Waffles for dinner?” we both get this devilish look in our eyes. “We shouldn’t, but let’s be baaaad tonight.” Second, dinner isn’t meant to be this easy to make. I whip up the batter (this takes about five minutes), Sébastien puts the waffle iron on the table and we’re off. The best is that we make the waffles to order; once the batter is on the grill, each person decorates his or her side of the machine as they like. We close the grill, wait until it beeps and then enjoy our creations. Yes, we put the cheese in the grill right on top of the batter and it all melts in together. See why it’s so naughty? Our favorite topping so far has been a combination of emmental (aka Swiss cheese) and blue cheese. On Sundays, our farmers’ market is host to a slew of vendors who don’t come during the week. One of them is a cheese maker from Auvergne, a region in central France known for its agriculture, and especially for its cheeses. Every week, I buy a nice chunk of blue cheese called “Fourme d’Ambert.” It’s amazing (excuse me for my enthusiasm, but basically I can’t live without this particular cheese). Made from raw cow’s milk, it’s one of the lighter, creamier blues I’ve tasted. Apparently, “Fourme d’Ambert” is one of the oldest French cheeses. Legend has it that it was being made in pre-Roman Gaul and eaten by the Celtic druids living in the mountains of present-day Auvergne. Other toppings we like: goat cheese, toasted walnuts, fried eggs (no, we don’t put the nuts and eggs in the machine). I use the same recipe as for pancakes, which is gluten-free. If you’d also like the batter to be vegan, you can use water instead of milk and vegetable oil instead of butter. Even though these are savory, I keep the two tablespoons of sugar. I’d say it’s optional, as is the salt. So, although waffles for dinner is super fun, made with buckwheat, they can be pretty healthy (depending on what toppings you pile on, of course). 4. Add wet ingredients to dry and gently incorporate. DO NOT OVER MIX. You should have a thick, slightly lumpy batter. Add some more milk if you think it’s too thick. 5. 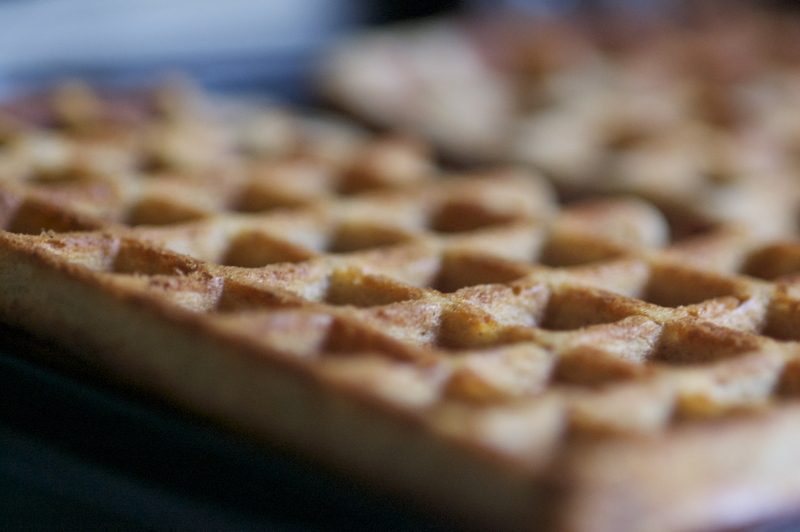 Cook on a warm waffle iron and add ingredients to be melted/cooked along with the batter. Add any others afterwards. What other toppings would you suggest? This entry was posted in Recipes (All), Recipes (Gluten-free), Recipes (Vegan), Wine & Cheese and tagged cheese, mains. Bookmark the permalink. Does’t sound like you got very much! We always get enough batter for two savory waffles, plus extra for dessert. Maybe it depends on the size of the waffle maker?